Subj: Re: Planet George - This is TOO BIG to consume. Would you believe, in spite of all that watching, they missed one? There is a sixth planet you can see without a telescope, a planet named George. "George" is not as bright as the others, but it is there, glowing like an aqua-blue star of 6th magnitude. It measures four times wider than Earth, has more than 30 moons and a dozen or so thin rings. George goes around the sun every 84 years, always spinning on its side as if something knocked it over. April 11, 2006: Ancient people didn't have TV or electric lights. So, when the sun went down every night, they got their entertainment by watching the sky. And it was entertaining. Without city lights to interfere, the Milky Way was spectacular. Meteors flitted across the sky. Zodiacal lights chased the sunset. Of special interest were the five naked-eye planets, the ones you could see without a telescope. (The ancients didn't have telescopes, either.) Countless hours were spent watching Mercury, Venus, Mars, Jupiter and Saturn, whose movements were thought to control the affairs of men. Do you have any idea what you have just done? You found First Father at the Harlot of Babylon!!!! This is so incredible I cannot believe it came to us. Jake, you have just proven that the Hellenes of Alexandria were perfectly aware of the Seventh Planet from the Sun, in perfect contrast to the rationalization presented in the mundane opinion of NASA provided above. Note the "planet" next to Cancer on top of the "sprig of wheat" in the hand of Virgo. The Napoleonic Album got it wrong. They saw a snake above the planet icon. It is not a snake. It is a hieroglyph for the name of a planet. The hieroglyph is transliterated SBK. "The meaning of three hieroglyphs is in fact the name “SBK” which stands for “Sebek”, which according to Brugsch is the Egyptian name of Mercury." Now consider the time for the Denderah Zodiac if the Ptolmaic Pharaohs knew of the cycles of Uranus. The fact that they drew it is the most incredible metaphorical placement possible, means that Sebek was known to be ancient long before the beginning of the Age of Pisces. They would have known that Uranus was more "ancient of days" than Saturn. In fact, Uranus would have been "older" than Saturn, and thus, the Father of Saturn, or the father of Chronos, the father of Time Itself. Uranus would have been First Father. 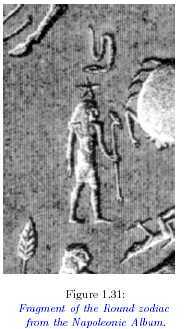 This entity had the name SBK in Egypt for thousands of years. Like Tauret, who was the Egyptian "Mother of Time," Sebek was the "Father of Time." 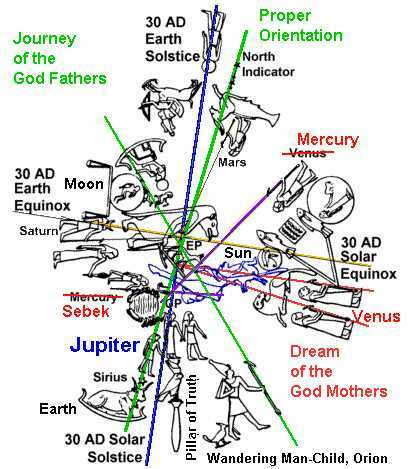 Thus, Jupiter was not set aside to stand on Hathor's Head as a conqueror of Mother Earth. Jupiter was made humble by First Father at the Light of Virgo and sent down to Earth as a savior of Time. An eternal calendar saves enormous amounts of time attempting to schedule celestial and social events. Jupiter was the mythical king whose star was seen in the east, but by virtue of the position of Sebek, the Father and the Sun were One. 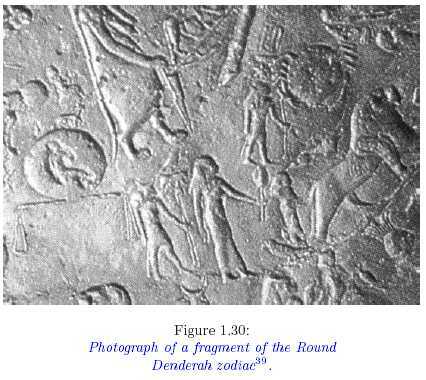 The Denderah Circular Zodiac was created to record the time when both planets sat at the back of Virgo. This was to be the moment of the Birth of the King of Kings on Earth. This is so big, that it will rattle every clock on planet earth when it is completely revealed to the arrogant scientists who say that the ancients never saw Uranus. In short, all the traditions of Western Civilization after the time of Cleopatra were based upon what the Wise Men saw with their own eyes. Precisely as identified in the Gospel verses of Matthew and Luke. Is that not an incredible sight? If not, hang on to your britches, i.e., gird yourself. They did not lie to us. They simply had no way of revealing that the Father Spirit was coming down to Earth as the Son of the Father of Time to children who could not see the stars, much less comprehend the meanings of their names. Humility is the first step to wisdom. Thus, when King Jupiter came down to earth, the eternal calendar of Western Civilization was born. The moral is as cosmic as it gets. But, it is a verifiable scientific and Gnostic fact. It really happened, in spite of the arrogance of NASA and the theological. pin heads who consume our lives because they cannot measure time in accordance with the stars of the ancient wise men. Nevertheless, there is an additional moral we cannot lose sight of. If Uranus was seen, as is clearly shown on the Denderah Zodiac, then the adage "Let George Do It," takes on a new meaning. George is Uranus. Uranus is First Father. First Father caused the birth of time. Who else can we let do it? Are we the Father's of Time, or are we consumed by youth, which is the just a lack of time? Saturn is only given 29.5 years in its cycle of life, and is an eternal adult. Jupiter is only given 12 years in its cycle of life and it is an eternal teenager. At 84 years in its cycle of life, Uranus is the Grand Father of the visible celestial Gods of the star Sol. To the ancient wise men, Jupiter and Jesus were One, Jupiter and Uranus were One, Uranus and the Father of Time were One. Thus, Jesus and the Father are One, precisely as they revealed. Can our cycles of life be consumed by Saturn, or is Time the plague of all youth. 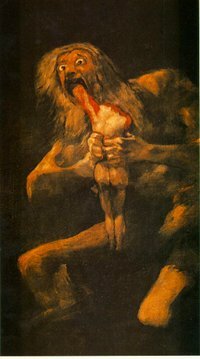 Saturn Devours His Children, Francisco Goya, c. 1815. Cronus learned from Gaia and Uranus that he was destined to be overcome by his own son, just as he had overthrown his father. As a result, although he sired the gods Demeter, Hera, Hades, Hestia, and Poseidon by Rhea, he swallowed them all as soon as they were born to preempt the prophecy. Finally, when a sixth child, Zeus, was about to be born, Rhea sought Gaia to devise a plan to save Zeus and to eventually get retribution on Cronus for his acts against his father and children. Rhea secretly gave birth to Zeus in Crete, and handed Cronus a stone wrapped in swaddling clothes, also known as the Omphalos Stone, which he promptly swallowed, thinking that it is his son. Rhea kept Zeus hidden in a cave on Mount Ida, Crete. According to some versions of the story, he was then raised by a goat named Amalthea, while a company of Kouretes, armored male dancers, shouted and clapped their hands to make enough noise to mask the baby's cries from Cronus. Other versions of the myth have Zeus raised by the nymph Adamanthea, who hid Zeus by dangling him by a rope from a tree so that he was suspended between the earth, the sea, and the sky, all of which were ruled by his father, Cronus. Still other versions of the tale say that Zeus was raised by his grandmother, Gaia. In closing, we must witness the great mystery revealed by the ignorance of the modern astronomers with their "narrow visions" of far far away places in the telescopes that cannot see the Eyes of the Gods. In due time, the existence of the Father of Time becomes apparent to all youths, even those rock headed fools we call modern scientists, and those air headed prudes we call theologians. God is. God was. God always will be. When we come out of the belly of consumptive time, we share in the Cosmic Mystery. The answer is at the Golden Fleece. The fleece says, "I think, therefore, I am." But, like the Golden Calf that Moses fed to the displaced Mesopotamians, we must also sacrifice the Golden Fleece by consuming its Time in the Vernal Sun. Fleece is evidence that a ram man-child has been sacrificed. The ram man-child is the arrogance of Jupiter that says, "If I rule one year, I rule all years" "I can't wait to be king." It is time for self ruling Kings to find their star and come down to earth where they can take a humble stand. Jake, this seemingly innocent little post regarding a planet named George is the most profound revelation we have ever uncovered. You need to sit down and spend some time looking at the images I posted at the following link. If you can since the truth regarding the placement of Sebek on the Virgin's Light on the Denderah Zodiac in the Temple to Hathor to mark the beginning of an Eternal Calendar, then you will have achieved the greatest miracle of all time. You will have witnessed the death and the resurrection of the "I Am," and understood who you are. Do not consume one more minute of time without realizing that every verse in the Bible has just been proven to be the Original Word of God. That is BIG, buddy. As BIG as it gets. Our predecessors stopped worshiping dead kings with the creation of the Alexandrian Calendar. They established a course where all civilization would worship at the feet of the King of Kings. This is precisely why the Pyramids of Egypt were constructed. It is why the Pyramids of Teotihuacan were constructed. Our ancestors were attempting to give us MORE TIME. Rhea fed Chronos a rock wrapped in swaddling cloths. That rock is the Rock of Ages which Mary wrapped in swaddling cloths. The Lord Jesus has the exact same purpose to this very day, and for all time. There are two words that copletely sum up the omen of the break up of comet 73p/Schwassmann-Wachmann and the conjunction of Uranus and Venus. See if you can figure out what the two words are. Don't cheat. Think about what time it is when th conjunction occurs. Here is a hint. Look for bunnies. Here is another hint. Look for colored roe. Here is another hint. Look for lilies. Forever grateful that you were there to show me the way. Thanks friend, thanks for giving me more time.